1)The competition will follow the latest track-and-field competition rules approved by the CAA and the competition rules, guidelines of technique meeting of Hainan (Sanya) International Marathon 2019. 2) Start：Start the race at the same time in different starting areas by hearing the gunshot. 3) Start order: In the sequence of amateur marathon athletes, half marathon athletes, lover’s marathon, mini marathon athletes (divided in separate zones), with 10 meters in-between. 4）Roll-call: All participants have to arrive at the designated area to conduct the roll call prior to the stipulated time. Only Marathon,half marathon, lovers’ marathon will conduct timing chips, all runners must wear the timing chips provided by the OC . The entire race will use the disposable timing chips as counting method, the timing chips will start working once the participants pass through the start point. Runners of Marathon,Half Marathon, Lovers’ Marathon shall pass all timing carpets respectively placed at the starting point, key points along the route (every 5 km), turning around and the finishing points. The final result shall be null if any of the timing points is missed even if the race is finished within the cut-off time. The OC will generate either gunshot result or net timing result at the same time after the competition concludes. The OC will provide one time used chips and no deposit for the chips. The final rankings of the top 3 of Marathon,Half Marathon, Lovers’ Marathon will be counted by gunshot results, the rest rankings will be counted by net timing results. 7) Baggage Deposit and Collection: Participants shall deposit personal belongings. After finishing the race, participants shall go to respective area for collection. Please do not put valuables in your deposit bag (such as mobile phone, identification document, cash, keys, credit card, iPad, etc.). In case of damage or loss, participants shall bear all the consequences arising. Baggage deposit and collection service at the starting point will be available till 15 minutes prior to the gunshot. Please notice that the closing time for baggage collection will be 14:45 on race day at designated areas. hose who are unable to collect the baggage by above-mentioned time can go to the organizing committee and claim storage bag within one week after the race day. After one week, all unclaimed baggage will be regarded as none’s by organizing committee. No baggage deposit and collection service for Mini Marathon entrants. Medical aid stations will be set each 2.5KM start from 5KM point, and also each finishing point will be set a fixed medical aid station. AED medical professionals will be stand by throughout the entire course. Medical aid stations and volunteers will serve throughout the entire race course to assist medical service to keep the pace of play, runners can ask for help. 10)Please refer to the Event Program for any further competition information. 11)Doping control will be conducted according to the CAA regulations and terms and conditions of Hainan Sanya International Marathon 2019. All Marathon entrants should be at least 20 years old by race day (born before 31st ,Dec,1999). All half Marathon entrants should be at least 16 years old by race day(born before 31st,Dec,2003). No age limitation for the Mini Marathon entrants, but those who was born after 31st Dec,2005 should be accompanied by their parents(leastly one parent AS ACCOMPANY ENTRANT) and original household register to participate in the competition. Parents must bring their own valid ID documents(passport or Valid Military Identification)Those participants who is under 18 or above 70 (inclusive) will be regarded as entrants only if their guardians or legal agents signed for the participants declaration. a. Congenital heart disease and rheumatic heart disease. b. Hypertension and cerebrovascular disease. c. Myocarditis and other heart diseases. d. Coronary artery disease and server irregular heartbeat. f. Having cold symptoms two weeks prior to the race. g. Other diseases that is not suitable for sports. Fields 20000, Marathon 5000 quota、Half Marathon（including lovers marathon）5000 quota、Mini Marathon 10000 quota. Those who finished the fully registration at the earliest moment will abtain limited spots. During the Registration Period, all applicants have to log on the official website to conduct the registration followed by related regulations, please read the ’entrants guide’ officially announced by the OC for the exact time and date for the registration. c. Individual or group applicants are all available. Athletes still in the period of a ban by CAA. Athletes still in the period of a ban by the OC of Hainan (Sanya) International Marathon. e. Please read the ’entrants guide’ at the official website for further information. a. Chinese entrants (including Hongkong, Macau and China Taipei): Registration Fee: 100CNY/person for Marathon,half marathon, 100CNY/2 person for Lovers’ marathon; 50CNY/person for Mini Marathon.
. b. Overseas entrants: 50USD/person for Marathon,half marathon, 50USD/person for lovers’ marathon; 30USD/person for Mini Marathon. c. OC has the right to determine the qualifications through the certain registration conditions, no refund for successful entrants. Runners shall pick up their race packs at the designated place from March 7(9:00-18:00), March 8(9:00-18:00), March 9(9:00-23:00) after submit valid original identifications(ID card, Military id, passport). For details, please refer to the ‘Race Pack Collection Guidelines’ from the official website,wechat, weibo. Not only no refund will be claimed for those who qualified by the OC and quited the race, but also not allowed to collect the race packs. Runners shall guarantee validation of personal identification. OC has the refusal right to those who breach the policy of race packs collection and no refund will be claimed for these wrong behaviors. a.Each of the top 100 male and female runners in Marathon will receive prize money (in CNY, see the table below). Each of the top 3 male and female runners in Marathon will receive a trophy,a medal, a set of sportswear. a. Each of the top 24 male and female runners in Marathon will receive prize money (in CNY, see the table below). Each of the top 3 male and female runners in Marathon will receive a trophy，a medal and a set of sportswear. top 24 couples in lovers Marathon will receive prize money (in CNY, see the table below). top 3 couples will receive a trophy，two medals and two sets of sportswear. b.all the couples of Lovers Marathon will be regarded as finishers only if the couples hand by hand come across the finish point and also the difference between two result of the couple is less than 1 second. c.Those who involved in lovers Marathon also could compete for individual prize money, sportswear and trophy, but there is no repeat for medals. announced at the official website within 24 hrs after the race day. If there is no objection 10 days after the announcement, the prize will be transferred to the provided bank account, also it is available for the local awardees to apply the prize money at the office of OC by providing original ID card and banking information within 30 days after the announcement of the final result. Athletes will be disqualified if they doping test failed, however, the ranking for all will not be changed. Those who are reported to be in violation of the rules and regulations of the competition and confirmed by the OC will be removed from the ranking. b. No prize money payment will be made on-site, all awardees please bring your own valid brank account, personal signed ID card copy and mobile no. to the prize money unit to conduct related process. F. According to the Chinese tax regulation, 20% personal income tax will be levied on the winnings, and will be withheld by the Organizing Committee. G. All the finishers prior to the cut off time will receive finisher packs and medals. H. All the finishers prior to the cut off time should log on the official website to check the results and print out the certificate 24 hours after the race concludes. I .All the Mini Marathon entrants will receive a certificate, no timing chips service for the entire Mini Marathon. J.All the runners will receive T-shirt, Number bib, back pack and participant guide, the runners of lovers marathon (belongs to half marathon) will receive special lovers marathon bib no. A. In order to enhance the management of sportsmanship and discipline in racing, the organizing committee strictly prohibits transferring (selling) or receiving (buying) qualifications for participation in private and prohibits anyone from accessing the track to participate by means of imposture, rub running, counterfeiting of the race number bib and using nonofficial race number bib. Once detected, the violator will be forbidden lifelong to participate in all events held by the organizing committee of Hainan (Sanya) International Marathon Organizing Committee and reported to Chinese Athletic Association to impose additional penalties.All aftermaths as a consequence of imposture, rub running, counterfeiting the race number bib and so forth shall be undertaken on the violator’s own. Where economic loss and severe consequences have resulted, the organizing committee will reserve its right to inquire into the violator’s legal responsibilities. n. violates other race rules or regulations. Those who enrolling by misrepresentation or transferring entry to another person should be responsible for any consequences arisen. The OC will purchase personal accident insurance for all runners and staff. Please carefully read the insurance terms on the official website before the events start. The insurance policy will be determined by the registration information, those who conducted the wrong registration will lead to fail purchasing insurance and must be responsible for the consequences it might generated. Please log on the website to read the insurance guidelines or check out at the designated registration units. 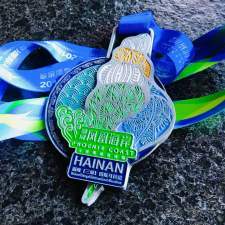 The Organizing Committee of Hainan(Sanya) International Marathon reserves the rights to interpret the aforementioned matters. During the Registration Period, all applicants have to log on theofficial website to conduct the registration followed by related regulations, please read the ’entrants guide’ officially announced by the OC for the exact time and date for the registration.